Maintain the pressure within acceptable limits. Cool the reactor from the hot normal operating temperature (~ 500F) to the cold or refueling shutdown temperature. This design uses high pressure (1500 to 3000 pounds per square inch) piping nominally 1.5 to 3 feet (0.5 to 1 meter) in diameter. 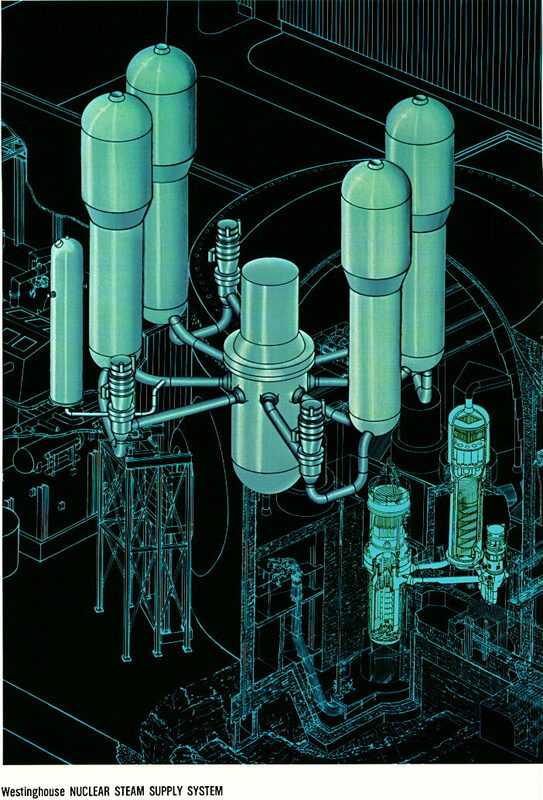 Two figures of the Reactor Coolant System are linked. One (267K) shows the relative positions of Reactor, Pressurizer, Steam Generator, and Reactor Coolant Pumps for a typical 4 Loop plant. 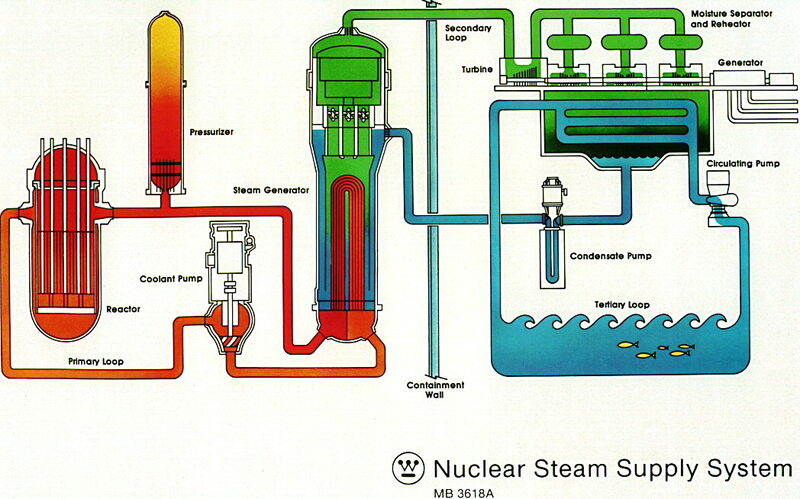 The other (191K) illustrates the flow path for a typical Reactor Cooling System. Pressurizer safety valves that open automatically to prevent overpressurizing the reactor coolant pipe. Note-The illustrations in the links above in this section were provided courtesy Westinghouse Electric Corporation. In addition, there are usually automatic air or motor operated valves that would open below the setpoint of the Pressurizer safety valves to provide added protection from overpressurization. These are usually referred to as the Pressurizer Power Operated Relief Valves (or PORVs). It should be noted that a single loop may have vertical or horizontal steam generators. See the Steam generator. page for more information on this. CANDU and VVER designs use the horizontal steam generators. PWR designs use vertical steam generators. A single loop may use 1 or 2 reactor coolant pumps per loop. Combustion Engineering plants use 2 pumps per loop; the other manufacturers usually use 1 pump per loop. CANDU, B&W, and ABB-CE designs use 2 loops, Westinghouse -2, 3, or 4 loops. Some designs (e.g. 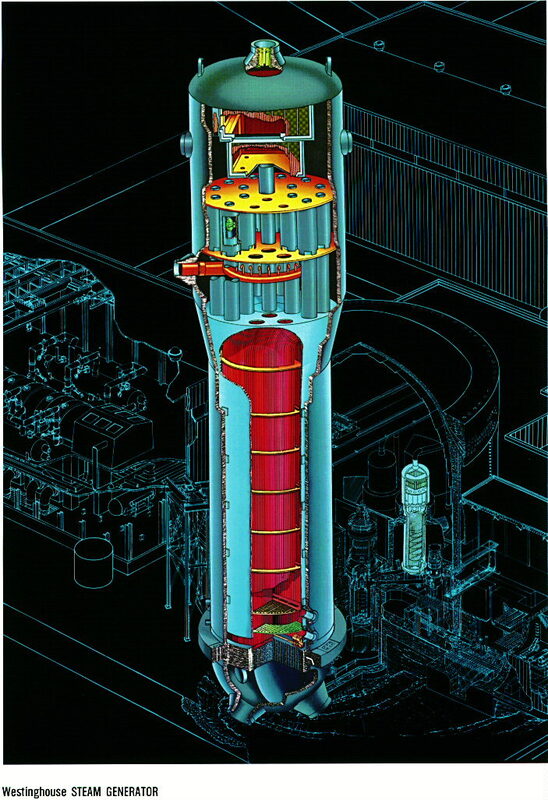 VVER) have motor operated isolation valves in the reactor cooling loops on both the hot and cold leg sections of pipe. This feature allows isolation of one loop and reduces the likelihood of losing water from the reactor if there is a major loss of coolant. This design uses lower pressure (1500 pounds per square inch) piping nominally 1.5 to 3 feet (0.5 to 1 meter) in diameter. 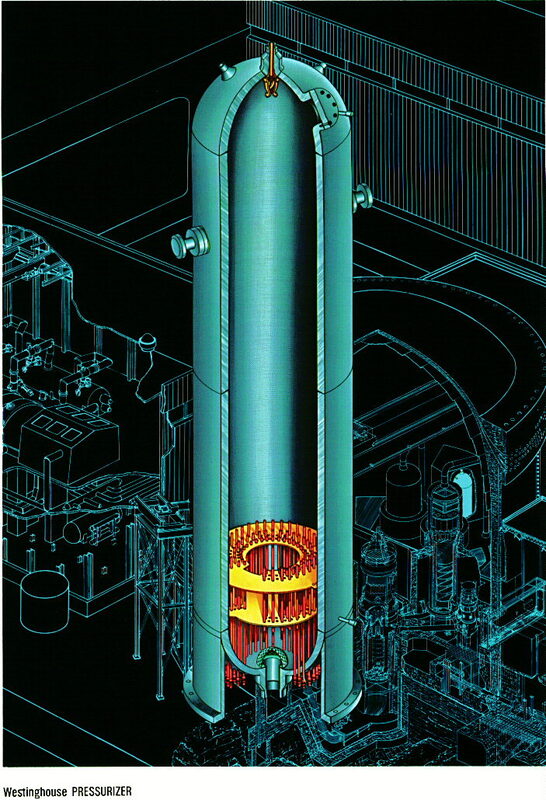 The BWR design allows bulk boiling in the reactor. 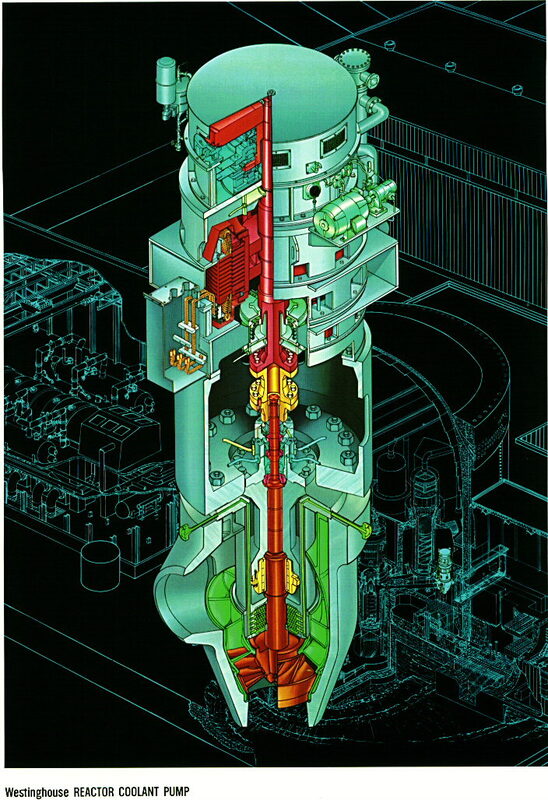 The BWR recirculation loop allows water to be removed from the reactor for cooling down from the hot (~550 F) condition to the cold or refueling (~100-200 F) condition. Water can also be diverted to remove chemical impurities and unwanted radioactive materials. Each loop has a single recirculation pump. This pump is used to regulate the power in the reactor. As recirc pump speed is increased, the power is raised. The Recirc System page provides more details.